Thiru Vekka is one of the 108 divya desam temples situated in Kanchipuram. The legend behind the place Thiru Vekka goes like this. Once there was an arguement between Brahma and Saraswathu as to who is greater between Saraswathi and Sri Lakshmi. Brahma said that it is Lakshmi Thaayar who is found on the heart of Sri Vishnu is the greatest. Next, Saraswathi asked which river is the big river. Brahma answered that the greatest river is River Ganga which is originating from the feet of Sri Vishnu . On hearing this, Saraswathi got angry and disappeared and went to the banks of river Ganga and started doing Tapas. Meanwhile, Brahma wanted to do an Ashwametha Yagam in Kanchipuram. He sent for Saraswathi through his son Vashistan to join him in the Yagam. Saraswathi refused to come along with him. Undaunted, Brahma started the Yagam along with Savithri and all of his wives with him. On seeing this, the Asuraas wanted to destroy the Yagam and went to Saraswathi and told her about the yagam and the participants. Saraswathi got angry on Brahma and started as "Vegavathi" river started to gush towards the place of the Yagam to destroy it . Sriman Narayana in order to protect the yagam stopped the river by lying across the river on Aadhiseshan. Because of this, this perumal is also known as "Vaga Sethu". This Vega Sethu then became as "Vekkanai" , "Vekka" and now called as Thiru Vekka. There is another story about the sthalam and the origin of the Yathothkaari Perumal. When Thirumizhisai azhwar was living in Kanchipuram, a very old lady used to do house chore daily and did this as a service to him. Pleased with her services , Azhwar changed her to a beautiful young woman. Falling for her beauty , the king married the her and she became the queen. On hearing the secret of an old lady becoming a beautiful woman, he was desperate to meet Thirumizhisai Alwar. Kani Kannan was a great follower and disciple of Thirumazhisai Azhwar. The king called Kani Kannan and asked that Thirumizhisai Alwar should come to his palace and should sing a verse on the king. Kani Kannan said that all the verses and songs that comes from the mouth of Thirumizhisai azhwar are only towards to Sri Narayanan and he will never come to the palace and sing a verse praising the king. The king then tried to bribe Kani Kannan with gold ornaments and other valubles and since he being the disciple of Thirumizhisai azhwar, asked hime to sing a verse on him. Kani Kannan refused saying that he will not sing any song praising humans. The King got annoyed and upset on hearing this and ordered him to get out from Kanchi immediately. Kani Kannan went to Thirumizhisai azhwar and explained about what had happened in the palace and prepared to start getting out from Kanchipuram as per the king's order. On hearing this, Azhwar also wanted to leave along with Kani Kannan. While they were going, he sung a song on the Yadhothakari Perumal asking Sri Narayana to raise from his Aadhisheshan and follow them out of Kanchipuram. Perumal obliged and He also got out of Kanchipuram following the Azhwar and Kani Kannan. On hearing this, the king and the people of Kanchi, pleaded with Kani Kannan to return to Kanchipuram. Moved by this, Kani Kannan along with Thirumizhisai Alwar came back to Kanchipuram. While returning, Alwar sung a song asking Sri Narayana to come back to Kanchipuram and go back to sleep on his Aadhiseshan in the temple. Sriman Narayanan again obliged and came back to Thiruvekka temple and gives his sayana kols seva. Since the Perumal obeyed the words of Thirumizhisai Alwar and did what he said, he is known as "Sonna Vannam seitha perumal". (sonna vannam meaning 'as told'). One peculiar aspect we can notice is that Sri Narayna, in his sleeping posture, has his head towrads the right side resting his head on his left hand. A posture you can not see any where. The Moolavar of this sthalam is Sri Yathothakaari. Other names are 'Sonnavannam seitha Perumal' and 'Vegasethu'. Moolavar is in Kidantha Kolam (Bhujanga Sayanam), facing West . 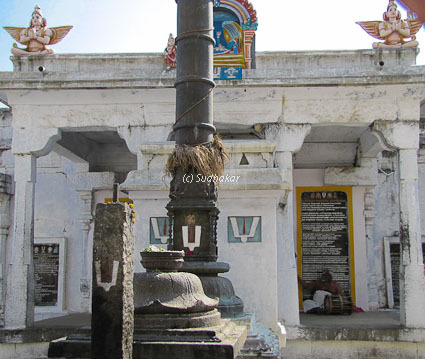 Prathyaksham for Brahma, Poigai Azhwar, Boothaazhwar and Kanikannan. 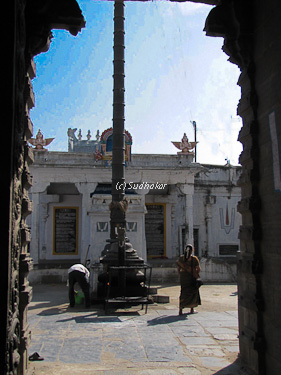 Temple location It is situated in Kanchipuram a kilometer away from Sri Varadaraja Temple.